Radio420™: ICP’s Revamped VIP Packages Now Available for Slamfest Tour! 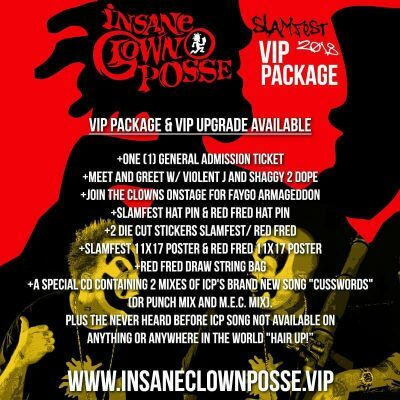 ICP’s Revamped VIP Packages Now Available for Slamfest Tour! Alright Juggalos and Juggalettes…my wig is officially flipped! The VIP Packages for the Slamfest 2018 Tour have been revealed, and they are definitely the best VIP package that Psychopathic Records has ever offered! First, you can purchase VIP only for $100.00 (if you already have your concert tickets), or buy your general admission tickets + vip package for $125-130 depending on the date! You can get both of these options at InsaneClownPosse.VIP. This is a HUGE step up compared to recent tours! Just remember that NOTHING is shipped, so you’ll have to go to the merch table after you purchase it to get all of your flavor and instructions on where to go for the meet & greet as well as Faygo armageddon. Grab your tickets NOW at InsaneClownPosse.VIP!